Figure 8 Daily Detox Tea is an Arbonne product sold online or through Arbonne consultants. The tea is packaged in containers with 20 tea bags. The product claims to help rid the body of toxins while cleansing the liver and kidneys. 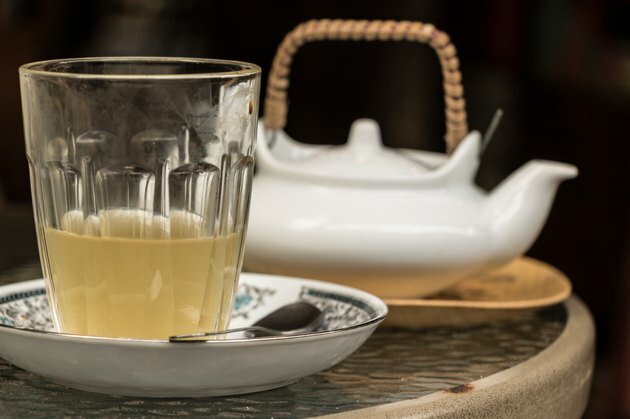 The tea is comprised of four different herbs, but it has not been evaluated by the Food and Drug Administration. Individuals who wish to use this tea for health purposes should contact a doctor or other healthcare provider with knowledge of herbal remedies for advice. According to the University of Maryland Medical Center, milk thistle is an herb that has been proven in animal studies to protect the liver from toxins. Human studies confirming these findings are inconclusive. The plant itself grows in the Mediterranean and includes a substance called silymarin that is an antioxidant and thought to protect the liver. Couch grass root is an herb that grows in the northern hemisphere. It is used as both a diuretic and to decrease inflammation of the kidneys and urinary tract. Studies supporting the use of couch grass root for these purposes have not been performed so proof of its effectiveness is unknown. Sarsaparilla is a vine that grows in warm tropical areas of the world. Small black, blue and red berries grow on the vine, but the root of the plant is the only part used medicinally. Historically, sarsaparilla root has been used by people in its indigenous areas as a tonic to treat many diseases from leprosy to syphilis. It is thought to be a blood purifier as well. According to Rain Tree Nutrition, sarsaparilla root has been shown to be effective in the treatment of these conditions. Burdock is a plant that grows in Europe, Northern Asia and also in the United States. In other parts of the world, burdock is eaten as a vegetable while Americans generally think of it was a weed. The root of the burdock plant is used to cleanse the blood and as a diuretic, explains the University of Maryland. A study verifying the effectiveness of burdock root as a purifier to remove toxins is lacking, but it has been shown that burdock root contains prebiotics to promote the growth of good bacteria within the digestive system. How Much Weight Do You Lose by Drinking Cho Yung Tea Every Week?